Yesterday, I went to the Post Office to pick up my 2nd international giveaway prize. The package was there for almost a month and it was about time to get it or else I cannot claim it anymore. 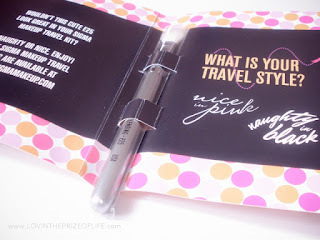 Here's what I've got from Courtney Clarke of Glamorous Barbie, a Sigma Travel E35 Blending Brush! Woot! Along with the brush, I also got a congratulations card and some brochure about their affiliate program. I won this 3 months ago and I never imagined that this brush looks really good. And what I like about it is the length, it's about 5 inches long which perfectly fits my travel makeup pouch. I finally have my travel-buddy now. I don't need to worry about where to put my long and old blending brush anymore because I now have Sigma. Thank you, Sigma Beauty and Glamorous Barbie!